(…) So we have developed technology for cars that can drive themselves. Our automated cars, manned by trained operators, just drove from our Mountain View campus to our Santa Monica office and on to Hollywood Boulevard. They’ve driven down Lombard Street, crossed the Golden Gate bridge, navigated the Pacific Coast Highway, and even made it all the way around Lake Tahoe. All in all, our self-driving cars have logged over 140,000 miles. We think this is a first in robotics research. Our automated cars use video cameras, radar sensors and a laser range finder to “see” other traffic, as well as detailed maps (which we collect using manually driven vehicles) to navigate the road ahead. This is all made possible by Google’s data centers, which can process the enormous amounts of information gathered by our cars when mapping their terrain. 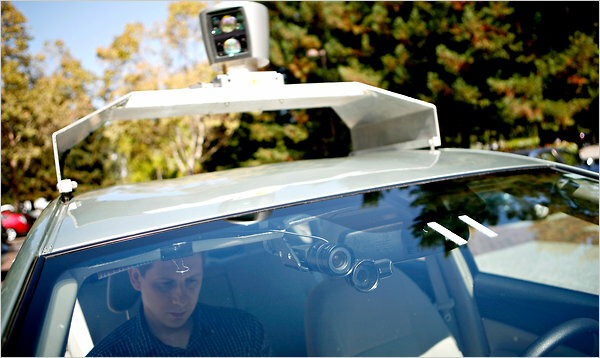 Charles just sent us the link to this NYT Science article on Google’s self-driving car program. We’ve been following the Stanford-Volkswagen program — I did not know that Google was participating. Is Sebastian Thrun now a Google employee? Sebastian lead Stanford’s “Stanley” DARPA Grand Challenge project. (…) During a half-hour drive beginning on Google’s campus 35 miles south of San Francisco last Wednesday, a Prius equipped with a variety of sensors and following a route programmed into the GPS navigation system nimbly accelerated in the entrance lane and merged into fast-moving traffic on Highway 101, the freeway through Silicon Valley. The Astrobotic lander has evolved to an all-composite design, with new locations to attach third-party payloads. The Payload Specifications document has been updated and can be downloaded here. The all-composite design achieves gains in stiffness and reductions in mass. The added stiffness raises the frequency at which it resonates, so that lower-frequency vibrations from the launch vehicle won’t set up compounded shaking that would destroy the lander and rover. The mass required for the all-composite lander may be half that predicted for a metal or metal-composite hybrid. This savings is being booked as margin available to solve engineering issues, rather than as increased payload capability. The lander will be constructed from just seven shapes, none of them larger than the walk-in oven the team is using to cure its composite parts. Astrobotic and CMU are now testing a prototype robot engineered to operate during extreme heat, and to survive lunar night. Soil temperatures at the lunar equator hit 224 degrees F at noon, cooking the rover from below as the Sun bakes it from above. The rover has a hot side with solar panels that it keeps pointed toward the Sun, and a cold side with a radiator that it keeps pointed at black sky. Cameras on top can turn 180 degrees so that operators on Earth can see the path ahead regardless of whether the rover is rolling forward away from the Sun or backward toward it. Lunar night is as cold as liquid nitrogen. Being able to survive lunar night extends the mission to another lunar day, and the Google competition pays a bonus for operating after enduring the night. The rover weighs 160 lbs. and is about five feet tall. Its “Tranquility Trek” mission to the Apollo 11 site is expected to last 10-12 days, until sunset cuts off solar power and the rover hibernates at temperatures expected to go as low as minus 298 degrees F. The robot will awake for further exploration two weeks later when the Sun rises, unless the extreme cold has damaged the electronics. Subsequent Astrobotic lunar expeditions will prospect for the water ice and other volatiles at the Moon’s poles, which can be transformed into propellant to refuel spacecraft for return flights to Earth, doubling the productivity of human missions. Astrobotic has just completed the first phase of a NASA contract to design lightweight robotic excavators that can remove the dry insulating soil that covers some of these valuable deposits. h+: Is there a way that someone reading this article right now can get involved with SU? PD: Weâ€™re going to allow people to participate online and view some of the lectures online, like TED does. And weâ€™re going to encourage people to attend day and 10-day programs, as well as nine-week programs. The first nine-week graduate student program starts on June 27th, and runs through the end of August. And the first three-day and ten-day programs will take place probably in October. To win the Google Lunar X PRIZE, a team must successfully land a privately funded craft on the lunar surface and survive long enough to complete the mission goals of roaming about the lunar surface for at least 500 meters and sending a defined data package, called a â€œMooncastâ€, back to Earth. â€¢ BONUSES: An additional $5 million in bonus prizes can be won by successfully completing additional mission tasks such as roving longer distances (> 5,000 meters), imaging man made artifacts (e.g. Apollo hardware), discovering water ice, and/or surviving through a frigid lunar night (approximately 14.5 Earth days). The competing lunar spacecraft will be equipped with high-definition video and still cameras, and will send images and data to Earth, which the public will be able to view on the Google Lunar X PRIZE website. And Carnegie Mellon has already put their hat in the ring. Can Stanford’s AI Lab be far behind?